I’m processing shea kernels to make shea butter. 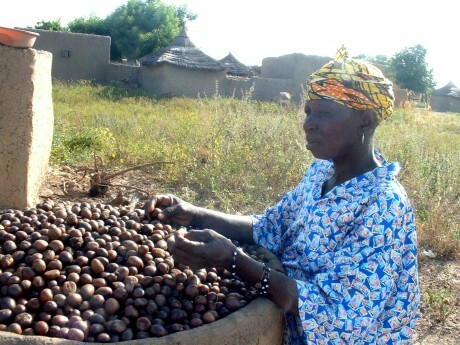 Only women process shea kernels and it is a difficult task. The shea trees grow naturally in the bush, we don’t cultivate them. They produce fruit in the rainy season and we (the women) go to the bush to pick their fruits early in the morning. We keep the fruit [which look like large plums] in a pit at home. We take them from the pit and spread them on the ground in the sunshine to dry. When they have dried out in the sun we put them in an oven for a week to slowly roast. When they are dry we break the shells and remove the kernels which are then ground into a paste. This is one of the toughest steps of shea kernel processing. In the past we had to pound them by hand and they are very hard because of being dried in the sun and by fire. Nowadays we have modern mills to transform the kernels into a paste, so it is easier. Next we churn the paste and then we stir it with water until it becomes white. At this stage we put it in a pot on fire and boil it until it produces a white liquid. When the liquid has cooled we pour it in a clean vessel. Then we put it in another vessel to separate it from the residue. When the liquid solidifies we remove it from the vessel and wrap it in leaves. Then it is ready to sell in the market. Shea butter is important because it is medicine; we eat it and make money from it. When you don’t have food you may sell it to buy food. It is important for health as well, when you apply it on your body. When children are suffering from a cold you can put shea butter in their nose to cure the cold. We also make soaps with it to wash our clothes and ourselves. We eat shea butter – we cook beans or rice with it. Shea butter is very important. 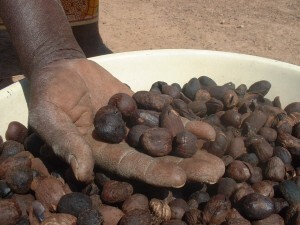 The protection of the shea trees is guaranteed by our tradition. For instance we don’t cut them down when we clear the farms. Before the rainy season the leaves of the shea trees sometimes appear like the plaits of a woman’s hair. When we see the shea leaves are like this, we cut them and bring them to the home of the village chief’s women. We organise a ritual ceremony to boost the shea tree’s fertility. All the women must plait their hair for the ritual ceremony during which we sing and dance. I believe in that tradition. I have seen that each year this has happened the shea trees has produced much fruit which we can then pick. This is why I believe in it.